How a Daily Investment of Rs. 13 Can Make You a Crorepati? The simple theory to become a Crorepati is to create opportunities, invest wisely, and retain wealth. Since 2000, Mr. Amitabh Bachchan has been asking, “Kaun Banega Crorepati” and the innermost instincts of almost every Indian would have shouted –ME! But, Einstein or Newton inside them had defied showing their knowledge and ultimately the rarest breeds of high IQ turned to collect the cheque of Rs. 1 crore. Apart from this famous game show, investing your savings can also turn you into a Crorepati. Yes, you heard it right. Now, your dream of buying a sports bike, going on a vacation in Bangkok, having a studio apartment can turn real by just investing in monthly Systematic Investment Plan (SIP) offered by mutual funds. But unlike the case of the game just discussed, it might take some long, and you know you can do anything for that. You might not believe, but investing as small as a sum of Rs. 13 daily can help you accumulate as large as a corpus of Rs. 1 crores. How? Keeping patience is the key. Investing merely Rs. 5,000 through a monthly SIP in an equity scheme can create a corpus of Rs. 1 crore in 15 years. And if you can be more patient then the investment can amount to Rs. 2 crore in the next 5 years i.e. in 20 years from now. To convince you, we have enough of numbers that would leave your jaws dropped and eyes popped out. Let us have a real life example of an investment of Rs. 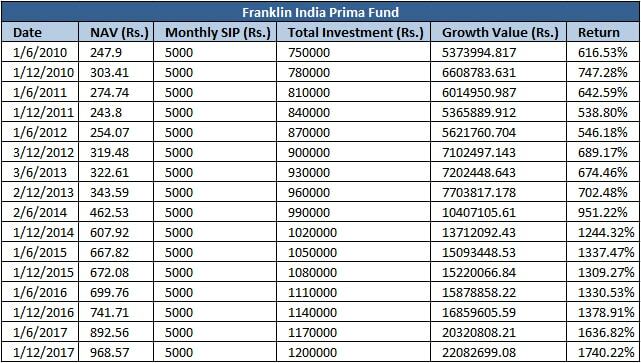 5000 through SIP in an equity-oriented scheme named Franklin India Prima Fund by an investor in 1997. The tables below depict the rest of the journey of investment on half yearly basis. Because of one smart decision of investing in initial earning age, the investment has seen a growth of 107% and accumulated over Rs. 68 Lac in just 5 years. If you have not noticed, the value of investment saw a deep decline from approx. Rs. 58 lac to Rs. 22 lac during the market fall in 2008 and rose back by 317% in just 2 years, growing the value of investment to Rs. 51 Lac again. This is the quality of mutual funds. They average out the risk to make the losses incurred by the market fall insignificant. All the above figures are true our knowledge and we assure you that this can happen with you as well. If not much, mutual funds are able to offer an average annual return of 12% and as much as 1740% in 20 years (as in the above case). The only necessity is to avoid following the herd. Unlike the general tendency, keeping the holdings and not redeeming the investment allowed it grow to Rs. 2 crore. Mutual funds are generally equipped with a well-diversified portfolio that ensures you don’t lose your principal amount at any instant of investment. Yes, patience and dedication are the key ingredients to prepare as huge amount as you want by investing in mutual funds. You can also invest in aggressive funds to earn mind boggling returns, but strictly when you are ready to accept the risks associated with the equity market. We know working from a life of little or nothing to living in the lap of luxury is the classic dream of every Indian. Then, why not invest today? Consult a financial expert at MySIPonline & have a fairly diversified portfolio which is in line with your risk profile and investment horizon and stick to your investment decision, that’s all you need to do.